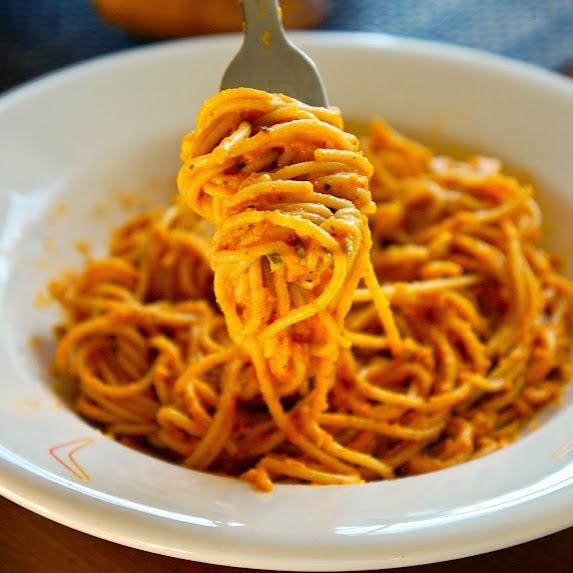 For the pasta sauce I cook garlic and onion first until fragrant to get garlicky flavor and blender with pumpkin puree and heavy cream, then simmer on the stove with the rest of ingredients, I use nature promise pasta or you can use any brand pasta you like. Heat olive oil, fry chop onion and garlic until fragrant and transfer into blender,mix with pumpkin puree and heavy cream , puree until combine. Transfer into medium soup pan,seasoning with dry ingredients, simmer in low heat and add cream cheese stir until cream cheese are dissolved/combine, cover up and simmer until hot/boiling. I definitely must try the sauce! i think roasted garlic within this recipe will made it even better for my licking! Ridwan, I love the richness and the easy preparation of your creamy pumpkin garlic sauce!